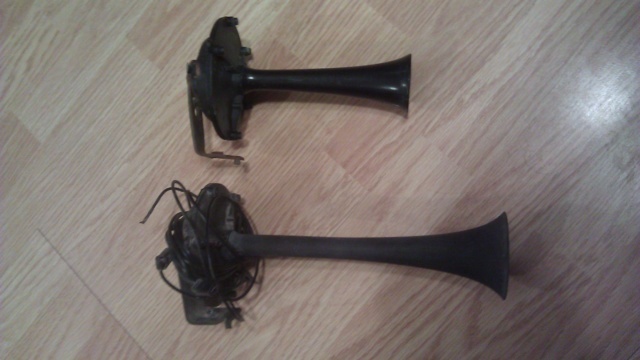 Here's what you need...optional factory trumpet horns from a Pontiac Grand Am! I've got two sets of these rare finds. Pontiac mounted one on each side in front of the inner fenders...facing downward. Was thinking these would be cool to mount in the Laguna...but, haven't really spent any time looking to see if there is room for similar mounting positions (my horn button doesn't work at this time, anyway). I've got several period correct AM/FM/8-Track players...but, none were specifically from a 1975 Laguna/Chevelle/Monte Carlo. Are you looking for an absolute correct radio for 1975 Chevy right down to the color of the pushbuttons and number font on the faceplate? Both of those varied among various GM makes and years. Also, 1973 (and, maybe 1974) had different plug-ins on the back for power and speakers than later years...not that you couldn't splice wires to overcome. Just wouldn't be a direct plug-in with existing connectors.